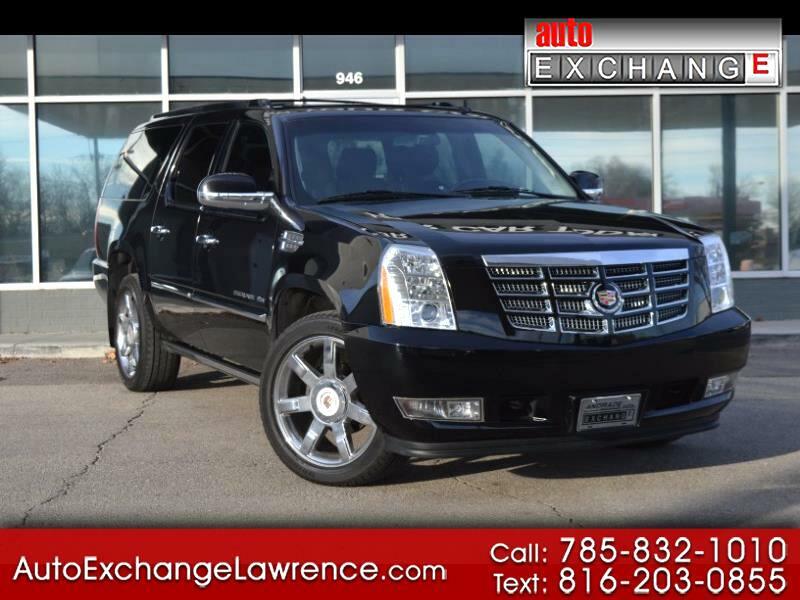 Offering tremendous space, comfort and power, our 2014 Cadillac Escalade ESV Luxury AWD in exquisite Black Raven has a dramatic presence unlike any other SUV. Under the hood of this prestigious All Wheel Drive is a 403hp 6.2 Liter V8 that is perfectly matched to a gracefully responsive 6 Speed Automatic transmission. This team provides near 18mpg along with a smooth, capable ride thanks in part to an adaptive and auto-leveling suspension as well as a locking rear differential. You'll make a great first impression in our commanding Escalade ESV Luxury that is enhanced by 22 inch alloy wheels, a sunroof and a distinctive grille that sets it apart in a crowd. You'll also enjoy the convenience of heated power-folding mirrors with driver-side auto-dimming, towing hardware, running boards and a power lift gate. With plenty of space for 8 passengers, the inside is equally impressive. A heated steering wheel, sumptuous leather heated and cooled power front seats with memory functions, heated second-row seats, a 50/50-split third-row seat, and tri-zone automatic climate control allow for everyone to be comfortable. An easy-to-use touchscreen navigation system will guide you while you stay safely connected via Bluetooth or while listening to your favorite songs on a premium 10-speaker Bose surround-sound audio system that also comes with two sets of wireless headphones. Experience safety and superiority on the road with a rear view camera, OnStar, anti-lock disc brakes, stability/ traction control, and many airbags. It's been America's dream SUV for years, now make the Cadillac Escalade ESV yours. Print this page and call us Now... We Know You Will Enjoy Your Test Drive Towards Ownership!